High levels of TPH and TCE were detected on-site after a suspected cutting oil/degreasing solvent spill. 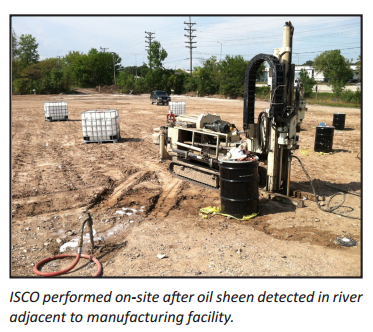 Remediation mandated after oil sheen observed in river adjacent to manufacturing facility. In situ chemical oxidation (ISCO) paired with excavation to remediate site. Tight treatment deadline met through the use of PersulfOx in 2,204-pound SuperSacks, which were delivered within a few days’ notice. An Illinois metal fabrication manufacturing facility has been in operation since the early 1900s and is still active today. The use of cutting oils and degreasing solvents lead to high levels of TPH and TCE on-site. The state of Illinois cited the facility for a violation when an oil sheen was observed seeping from the property into an adjacent waterbody. A mechanical oil recovery system was installed and absorbent booms were used to mitigate the oil from reaching the river. ISCO was selected as the remediation approach to address the contamination below the active facility through a series of applications. Additionally, the TCE area was treated with PersulfOx® via injection wells and a soil mixing application. Prior to the start of remediation activities, the primary consultant was removed from the project and a new firm was brought in. The remediation firm placed a tight deadline (a couple of months) to complete the full scope of activities. REGENESIS was able to assist with keeping the project on-deadline through the delivery of 2,204-pound PersulfOx SuperSacks, which were delivered within a few days’ notice. The consultant had a series of injection wells installed inside and outside of the building. PersulfOx was injected into these wells during three applications over a three-month period. Additionally, the TCE area was treated with PersulfOx through a soil mixing application using an excavator. The final step of the remediation plan is to treat the TPH-impacted soils outside the building through excavation, and Oxygen Release Compound (ORC®) Advanced Pellets will be used as a long-term oxygen source for enhanced bioremediation of the residual TPH. ORC Advanced Pellets are a pelletized version of REGENESIS’ widely used ORC Advanced and are designed specifically for direct application into excavations, tank pits and trenches. This pelletized, dry application material minimizes airborne dust while eliminating the need for specialized equipment and spray water required for powder-slurry applications.